I’ve been working on something that I’ve had in my head since last Easter, and I’m very excited to reveal it to you today- my new Printable Resurrection Set! We all put nativity sets out at Christmas time, and I’m not sure why resurrection sets aren’t more popular. So I made a printable version that’s the counterpart to my printable nativity set. All you do is print the pages provided from this post, color them, cut them out, and glue them around toilet paper tubes. The cutting is very easy… if you want it to be. For the most part, just cut around the outside lines. 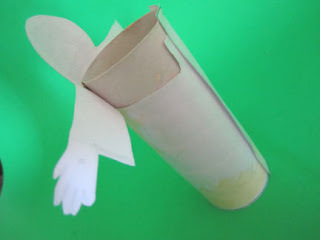 If you want something to stick out from the sides (like Jesus’ arms or the angels’ wings) you can cut them out around the edges and let them flap free from the sides of the tubes. The tomb is cut out and glued to the top of a tissue box. This part could actually stand alone as an empty tomb craft for Easter. The rock and tomb print on the same page. I used a brad to attach our rock so that we can swing it open or closed. I found brads in the scrapbooking section of our craft store. 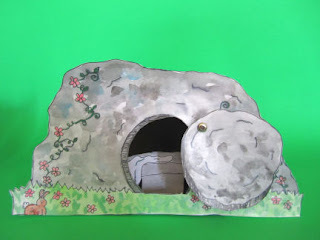 Cut the hole out of the middle of the tomb and glue it over the open hole in your tissue box, and turn it on it’s side. This makes a tomb you can actually place Jesus in. 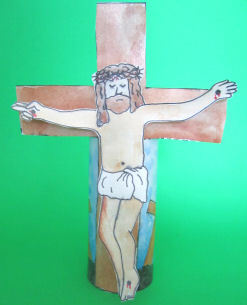 On the cross page, I also provide a Jesus that can go on the cross. The way you use this is to have your children tape Jesus onto the cross on Good Friday at noon. Then at 3, take Him down, place his body in the tomb, and close the stone. On Easter morning, replace Jesus’ body with the empty linen cloths. 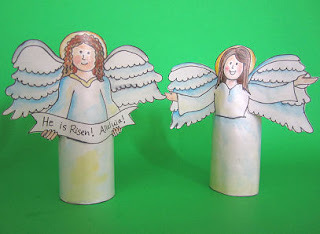 I wanted my Resurrection Set to hold up a little longer than our nativity set did, so I painted them with watercolor paints, laminated them from the top with contact paper, and then cut them out. I didn’t laminate them on the backs because they just glued around the cardboard tubes anyway. It would have been easier to attach them in the back with a stapler, but I couldn’t find mine, so I used glue and held them in place with clothes pins until they dried. Now, here are the printables so you can make your own resurrection set! The colored set is available on my new special page for those who are subscribers of Catholic Icing! If you’ve already made yourself a friend of Catholic Icing by subscribing, just look to the bottom of this post in your reader or email, and you’ll find a link to the “Subscriber Bonus Page”. If you’d like to print the colored Resurrection set for free, but are not yet a subscriber, no problem! Subscribe here, or by entering your email address into the box below. After entering your email address, an email will be rushed to your inbox for you to verify your subscription. Please click the link in it. After that, you will receive an email after the next blog post is published with access to the Subscriber bonus page! These pages are my own artwork and are free for any not-for-profit use by individuals, families, or educational organizations. Copies may not be sold, reproduced for profit, or published by anyone but me. If you’d like to post this calendar for others to find, I would ask that you link to my post and rather than my individual downloads because their location may change. When printing or running copies, please do not remove my website from the bottom of the page. Thanks! Do you prefer to just buy the color Resurrection set instead? You can purchase it right now for just $2.00. There will be an immediately download pop-up, as well as an email with a link to download that will arrive just a bit after your purchase. You amaze me. This is awesome! 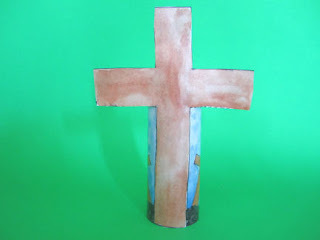 Thanks for sharing; I know what we are crafting during Holy Week! I can't wait to share this… I am such a Catholic Icing junkie. I just completed this craft with our 8 & 5 year old — the 8-year-old was wanting to conduct one of the occasional "sacrifice classes" he conducts for the family & this was the perfect craft. Thank you also for the idea about clear contact paper. The set-up looks terrific. Especially in the watercolors. Thank you for this wonderful craft! I laminated the set for longevity and found that the plastic is sturdy enough to stand on its own without a paper roll – they also look lovely when the light shines through them. Thank you, thank you for sharing your talents and ideas with all of us, who just mooch off your awesomeness. 🙂 Happy Triduum! Thank you!!! We prepared a set of "characters" as part of our Good Friday activities. We made a tomb last year out of chicken wire and paper mache (wow, was that an undertaking!) and this was the perfect project to compliment that. It would be great if you could add more people for next year. The kids like acting out the whole story. You could go nuts – Mary the Mother of God, Pilate, Caiaphas and the missing apostles would be excellent. Thanks so much for sharing your talents! OH my GOSH!! 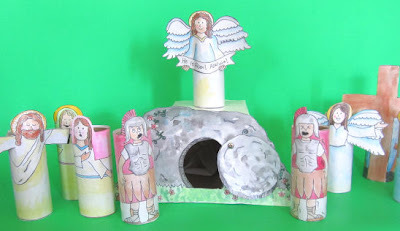 This toilet paper roll resurrection scene is sooo cute! I’ll definitely be making this for easter. Thought I’d even make Jesus using the bigger type of paper roll (the kitchen one) and perhaps put a few led lights behind the tomb opening to boost the effect of it all. Thank you so much for your heavenly ideas. I’ll most definitely be catholicicing very soon. Lacy, just wanted to say “well done”!! My five year old son has to complete an Easter Craft project and present it to the class. 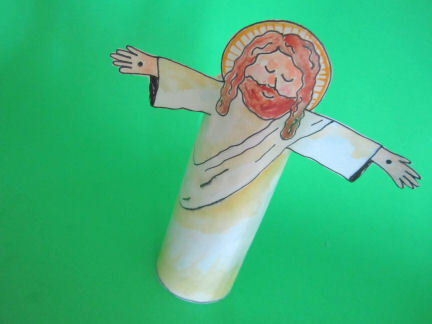 I googled “Easter craft for kids” and let him look through all the images that came up to pick his project……. I was knocked for a six, when he chose your Resurrection Scene, based upon the image of Jesus on the Cross!! It is a beautiful project for him to complete and I have printed the story for his teacher to read to the children as well. I am really proud of him for choosing something with the true Easter meaning! It is 1.30pm on a Saturday and he is in the kitchen colouring in his “people” – thank you Lacy, I will be passing your website details onto his teacher. Hi, I tried to download the colored templates, but when I click the subscribe button, it directed to page error. Could you please help me. Thanks a lot, I can’t wait to print this out for my students. Hi again, I managed to print the colored ones. Sorry for this. Found you via pintrest and just love this project! Thank you so much for sharing your time and your talent!! I love this take on the resurrection set. Thank you for sharing your gifting with others. We love these kind of printable crafts. Thank you so much for sharing! Just finished preparing them and looking forward to do the display in class. Yes thank you! Had the best time talking about the empty tomb with 4 year-olds this morning as we colored and assembled # 8 here in Florida. Dear Lacy: Thanks soooo much for the Resurrection Set! I love it…especially the painted one…the colours are soft and gentle. What a good idea! why not have a Resurrection Set just as we have nativity Sets. I am an Anglican priest and plan to use this on Easter Morning to tell the children the story. Then they can make their own! Thanks for this and for all your wonderful creative, easy and fun ideas! it makes me smile! Thank you so much for this … the exact thing I was looking for!!! My Yr 3/4 catechist class will love it when I produce this coloured set and tell them the story with it : ) You’re a very talented artist! Lacy, this is marvelous as always!! Thank you so much for this wonderful Resurrection Set. I especially appreciate the color version. Since my kids don’t love coloring, like I thought all kids did, that is frequently where our crafts get stalled. I recommend your crafts to EVERYONE, Catholic or not. Thankful that God has led me to such an awesome idea! It is hard to find a good Easter activity to do with my AWANA group that is based on the real reason for the season and not the bunny stuff! Thanks sister in Christ! Thank you so much. This is an awesome teaching tool for young children. Thanks for this. I’ve been looking for something “good” and think this is great! Thanks so much for this resource. I am a Methodist minister in New Zealand, and plan to use this to speak with the children in my church on Easter Sunday. 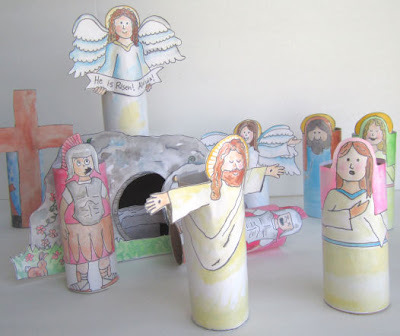 We also have a daycare centre for pre-school children, and I have used a Christmas nativity set with them before, so I know they will love this Resurrection set. It is so helpful to have something tangible to help the children understand and also remember what Easter is really about. I love this set you’ve created and am so thankful to have it as a visual for my 4 year old! But, I need help with page 7 …… I don’t know what to do with the cloth with the imprinted face nor how to make the cement slab/bench stand up like you show in your picture. If you’re subscribed by email, every email you get with a new post has a link at the bottom to the subscriber bonus page. Love your crafts. Thank you so much for sharing them! Any chance for some masculine angels? Having so much fun with the stations of the cross and the resurrection cut outs! 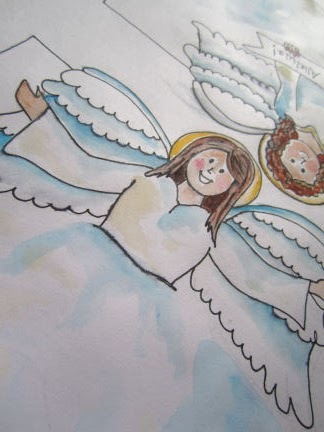 Your reward in heaven will be great for helping to teach little ones about God! I subscribed and have the link for the colored Resurrection set, but it just says error every time. Is there anyway you can send me the links. I would love to do them with my kids. They loved doing the nativity on at Christmas. Great ideas!!!!!! Thank you very, very much for your wonderful crafts. I started to make the resurrection set yesterday to take to church but ran out of time so will be taking it today. Thank you so very, very much for sharing your wonderful things. I have also wondered why we have nativity play sets for kids, Noah’s Ark sets & such, and nothing for Easter!!!!! I was wanting to make my own set for the past years, but did manage to buy one for cheap to display only…… But watching how my son is so involved in PLAYING with our wooden nativity set, I just was overjoyed when I found your printable one! I used your printable nativity for my sunday school class too– kids from unchurched, single-parent families who’ve never had nativity sets available to them. Just a priceless resource!!!!!!!!!! An answer to my prayers. I’ve wanted to have my son be able to “relive” Holy Week and this will make it possible! (Now all I need…… is a TRAVELING Mary & Joseph since I have them travel the house & arrive at the manger scene Christmas Eve (my son waking up in the morning to discover Jesus is born!!!. Also need a “Triumphant Entry” Jesus on a donkey/colt too…. maybe you have one I didn’t see yet…..). THANK YOU & THANKS BE TO GOD!!! 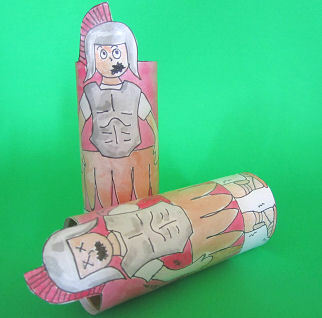 Oh– one other comment, maybe already made here before… I didn’t do the work to put these on toilet paper rolls– I found it MUCH easier to just print these on CARD STOCK paper!!! What a WONDERFUL idea – a Resurrection set! I’m going to tell my friends about this and about your website! I’m so glad I clicked on the bloggerhood link on Webkinz News/Parenthood Club. Thank you!! Have a blessed Resurrection Sunday! My 4YO LDS (Mormon) Primary class really liked this. I pre-cut the figures, then asked the class to color them. 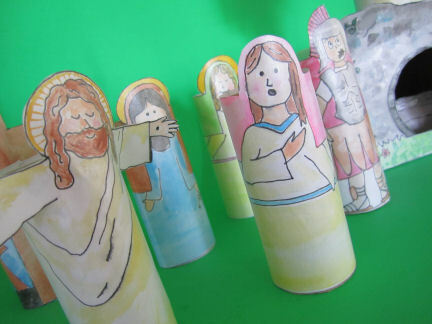 I stapled them into the tube-like figures, and used them to tell the events of the first Easter. The children were excited for the puppet show with the puppets they helped create. Can’t seem to get safari to let me print. I can get the b&w to view but when I try to print it yells at me! Any one else have this problem? Hoping to do a mass week with LO this week. Maybe try another browser. Not sure what’s wrong. I am trying to print the crucifix Jesus for my Catholic ABCs craft; every time I click the link it sends me to a Google documents sign in page. I don’t remember having to sign in there when I printed it last Easter. Do I have to sign up with Google documents to get the print outs? I love this and have been waiting eagerly (and rather impatiently) for a new post so I can get the link to print the beautiful colored version. Thanks so much for this! I love this site. It’s very resourceful. Just love this. I was wondering how you place the bed in the tomb and what to do with the face on the same page? I just taped it in. You can also place the shroud in the tomb however you want. I cannot thank you enough for all of the wonderful printables! I spent last night printing everything needed for the Resurrection Story and your ebook of Saints. My students are so excited too!!! I am so happy to have found your blog. You are so creative and generous for sharing everything. I placed your button on my blog so I will always have easy access. Thank you again!!!!!!! This is so cool! I am going to use this with my class this Easter. Thank you for sharing your creativity that God gave you! My class will absolutely love it! Thank you again and have a Blessed Easter! You have made my Easter season. This handout it adorable and a wonderful reminder of the greatest thing that happened on this year. You are most generous to share this. I will be using this in my 6-7 year old class on Sunday and it has been displayed for two weeks on my mantelpiece. Everyone who comes in comments on how sweet it is. You are touching the lives of many. Again, thanks. Thank you for this fun printable. I love your Nativity set as well, but I could’t save enough toilet paper rolls in time 🙂 My 5 year old loved doing this, and now we will keep it on display in our living room. 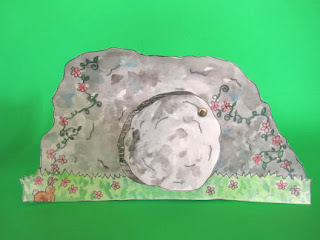 They are the first and last pictures in my Easter post. Muchas gracias desde México. Nosotros somos un centro de catecismo, y buscando algo para que a los niños y niñas se les haga más fácil comprender el tema de la Resurrección, encontramos esto, que hasta a nosotros nos llamó gratamente la atención. Muchas felicidades a la persona o personas que lo realizaron, Dios les ha bendecido con una gran habilidad, ingenio e inteligencia; es maravilloso que los pongan al servicio de los hermanos. El Señor Resucitado les siga bendiciendo día con día. Since I am a terrible planner and had no tubing or empty tissue boxes I used card stock to make all of these and it worked wonderfully. God bless you for all you do! I love this. Always wished you could get an Easter Nativity. I downloaded it to work on this week with my kids but page number 5 with the soldiers was blank. No picture. I would love to have them and thought you might like to now. Sunday school and use the Jesus and angel figure to go with it. 3 years later and it’s still sought after! 🙂 This is such a wonderful thing to add to our Easter weekend. We will start today on Good Friday by having the kids cut and color, then we’ll laminate. I am going to add a little twist by having them take a branch off of our thorny bush outside, so we can make a crown, and we will use actual fabric pieces for the tomb. Thank you so very much for sharing your talents and creating such a great craft for Jesus’ death and resurrection! I just want to say thank-you for all of the children’s hearts that you touch in this ministry. It is obvious that God is using you and your gifts to help children understand the meaning of His Word. I am truly blessed by your website and so are the many children who attend Windwood Presbyterian Church. This is an absolutely great thing I am going to use in my classroom! Lots of thanks from Romania! I’m using your Easter Resurrection set this time for my own kids and my kindergarten religious ed class. I printed it on card stock and just stapled them without the tp.roll. It’s so cute and everyone is going to love it. Thank you again! Hi Lacy, I have subscribed and hit the Subscriber bonus page, but it still won’t allow me to gain access to the free Printable Resurrection Set in color. Are you able to send it to me via email in order to download it? 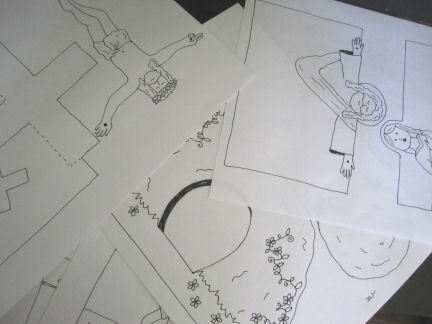 Thank you for the colored printables. I am excited to use them to tell the Easter story in the play time group I help run in our local community. We have usually around a dozen families from the local community come along with their children aged from birth to 4 years old each week. Am glad I found your website and thanks again. Yay! So happy you found it helpful. God bless!